Optimizing mass retail promotions and managing customer lifecycle using AI and machine learning. Which promotions were successful in the past? How should future promotions be planned in order to meet business objectives? Who are my customers and what are they buying? Can they be segmented into meaningful and actionable groups? These are the types of problems that Promotion Manager and Customer LifeCycle Manager solved for our enterpise users in the retail industry. As a Product Designer at Rubikloud, I designed user flows, wireframes, mockups, and hi-fidelity prototypes for these products. One of the things I’m really proud of is that I found opportunities to re-use UI components across both products for a truly unified user experience. I also developed the product demo in WordPress based on my work on hi-fidelity prototypes. Our Design & UX Director Martin Mark created a flexible, efficient, and robust demo system using WordPress that I was able to carry forward and build upon. For existing and new clients, this demo acted as an additional layer of idea validation in Rubikloud’s product development process. Like the product suite itself, the UI was designed to be modular and configurable based on the requirements of our enterprise users. I also introduced subtle animations and transitions across both products. Motion should feel natural, not forced in digital products. For example, since the creation of a promotion is alike to completing a form, I added transitions to guide the user through that process. Forms can become long and tedious, so it is best to break them down and introduce elements section by section. No doubt, adding motion to the UI also adds a little bit of personality, expressiveness, and gives the application a modern feel. I also initiated a project to transition our product design process, specifically the creation of user flows, mockups, and prototypes to Sketch, Zeplin, and InVision. This was very important to ensure the scalability of our team as we hired new designers. For the company, moving to these tools and services meant increased collaboration across teams and faster iteration on ideas. As part of this project, I worked closely with my super talented design colleagues Anna Pavlenko and Nat Cooper on building Rubikloud’s UI library in Sketch. The UI library was beneficial for the Design team when creating mockups and hi-fidelity prototypes, and for the Engineering team during application development. 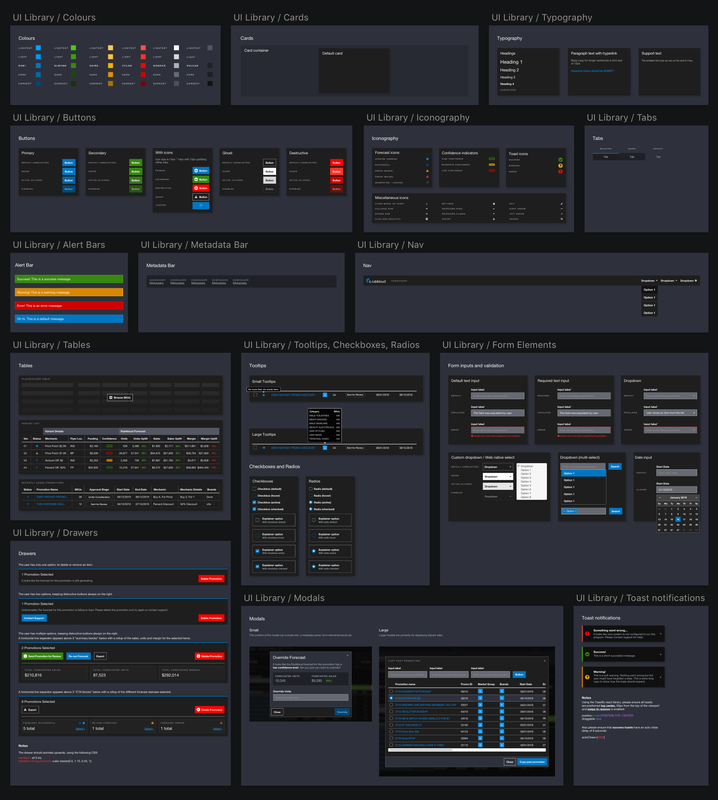 Ultimately, this UI library consisted of shared components that sped up product development. At Rubikloud, I was able to help build high quality product prototypes and demos that led to several new enterprise retailers to sign on as new customers. Additionally, Design, Product, and Engineering teams were happy with the new tools and services that were introduced as part of our product design process, which resulted in increased collaboration and faster product development. Several challenges, such as table interaction, were experienced throughout product development. Although iterative improvements were delivered over time, some of these challenges are still being tackled on frequent basis. Typical users of our products were Retail Analysts, Category Managers, and Marketers. Some of these users are comfortable working through thousands of rows of data. In order to make sure there was minimal learning curve for them, we tried to borrow some of the data structure capabilities and functionalities from products like Microsoft Excel. This enabled functionality like filtering, sorting, and searching through data tables. We did not want to break away from their mental model of working through massive datasets in tools like Excel. Tables simply represented a better and cleaner method of viewing and interacting with data. Improve home comfort with heat loss maps. Live a healthy, wealthy, and happy life.